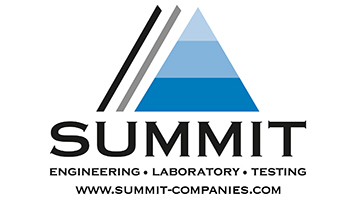 SUMMIT Engineering, Laboratory & Testing PC (SUMMIT) is an employee-owned multi-disciplinary engineering and consulting services firm offering Construction Materials Testing, Geotechnical and Environmental Engineering, Structural Engineering and Forensic Inspections, Residential and Retaining Wall Design, Subsurface Drilling and Chapter 17 Special Inspections, Advanced AASHTO, ACI, AMRL, CCRL and NCDOT Laboratory Testing. Headquartered in Charlotte, NC and with branch offices in Raleigh, NC and Charleston, Greenville and Columbia, SC, SUMMIT has over 150 employees and is continuing to add career and internship opportunities. We offer competitive starting salaries and benefits including professional development and certifications, employee stock ownership plan (ESOP), medical/vision/dental insurance plans, 401k plan, paid time off and holidays and a friendly, collaborative work environment. The SUMMIT Companies is an Equal Opportunity Employer. SUMMIT Engineering, Laboratory & Testing P.C. seeks a Corporate Recruiter to provide company-wide talent acquisition support. This role will provide an exciting opportunity for a growth-seeking individual to develop and execute the sourcing and recruiting strategy for our multi-disciplined, employee-owned engineering consulting firm. The Corporate Recruiter will lead all aspects of recruiting from hire forecasting and job description creation to extending final offers and on-boarding procedures. • Conduct full-cycle recruiting for all open positions including entry-level (campus) and experienced roles. • Develop and execute the company-wide (and position-specific) sourcing and recruiting strategy. • Partner with hiring managers and management to develop candidate profiles and job descriptions for open and upcoming requisitions. • Open communication with hiring managers throughout recruiting, hiring and onboarding process. • Source passive and active candidates and identify top talent for job opportunities with SUMMIT through utilizing job boards and recruiting tools to proactively locate candidates. • Coordinate and manage on-campus branding and recruiting activities to include career fairs, information sessions, lunch and learns, class talks, etc. • Build and nurture relationships with universities and community colleges across divisional locations. • Develop marketing materials to publicize company-wide career opportunities, specific roles and company culture. • Create, maintain and develop job descriptions and post jobs on social media outlet as well as external and internal job boards. • Manages Applicant Tracking System (Newton) and SUMMIT careers webpage. • Conduct initial phone screens and make recommendations as to which candidates should continue on in interview process. • Coordinate on-site interviews and recruiting process, main contact with candidates from initial contact to onboarding with a focus on providing a great candidate experience. • Contribute to company social media accounts to highlight open positions, upcoming branding/recruiting events and company culture. • Process pre-employment screenings for final candidates and draw up/extend final offers. • Attend industry and professional associations meetings/events. • Prepare new hire equipment and orientation materials and conduct new hire orientation meetings. • Conduct additional recruiting tasks as necessary. • Provide assistance to Office Manager with quarterly employee engagement events and activities, assist HR department with other special projects and tasks as needed. • Bachelors degree (required) from an accredited university with a focus in business, management, human resources, psychology or relevant degree. • Ability to listen effectively and ask questions as appropriate. • Ability to market and promote roles, employment opportunities and company culture. • Able to collect and interpret data to evaluate effectiveness or failure of the recruitment system from position opening to onboarding. • Ability to read, analyze and interpret general business memos and proposals. • Required knowledge: Microsoft Suite and social media posting procedures. • Preferred knowledge: ATS system(s), LinkedIn Recruiter. • Exceptional presentation, oral and written communication skills. • Problem solver with ability to think through and solve problems that may arise. • Excellent organizational skills: prioritizes and plans work activities, uses time efficiently and develops realistic action plans. • Strong adaptability and able to effectively handle changes in the work environment, manages competing demands and is able to deal with frequent change, delays or unexpected events. • Must have the ability to maintain confidentiality with all HR related items and employees. • 2-4 years of corporate and/or campus recruiting or closely related experience. • Proven ability to develop and implement a recruiting strategy with successful results. • Work setting is in an office atmosphere. • There is exposure to moderate level of noise that could include business office with computers and printers with light traffic throughout. • Some after hours and travel may be required, specifically during September, October and February, March. You must have the ability to use your hands to handle, finger or feel, reach, climb or balance, crouch, stoop, crawl, kneel and sit. You will have the ability to see and smell, including close, distance and peripheral vision, depth vision and ability to focus. This employee will occasionally lift and/or move up to 20 pounds. • Must successfully pass pre-employment screenings to include background and reference checks. • SUMMIT is a Drug-Free Workplace and administers pre-employment testing to verify employment.